This is the new Miss Universe 2008 Crown and the 57th pageant will be crowned with this masterpiece which was designed by CAO Fine Jewelry, Vietnam. Vietnam is also this years host for the event. “The curved design creates a natural rhythm and a stable structure for the crown, symbolizing the spirit of unity. The crown combines the beauty and the character of each nation, accomplishing the goal of the pageant, which is international unity”, explained designers Ms. Kim Lien and Rosalina Lydster. Valued at $120 thousand dollars, it is made of 18K white and yellow gold. It is comprised of over 1,000 precious stones; including 555 white diamonds (30 carats), 375 cognac diamonds (14 carats), 10 smoky quartz crystals (20 carats) and 19 morganite gemstones (60 carats). 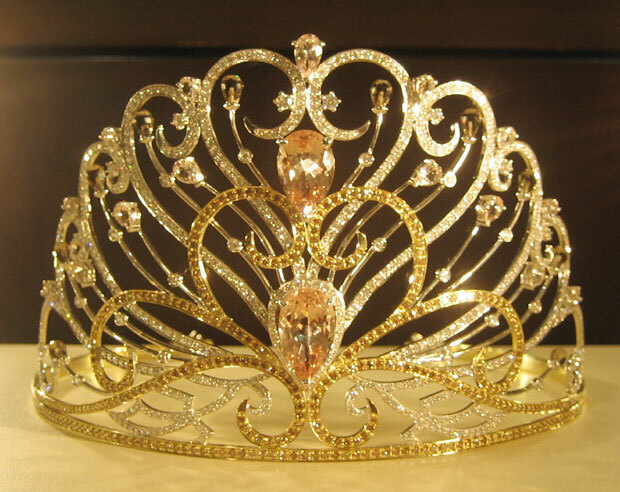 The colors of the jewels chosen for the crown have great significance. The yellow luster of the gold represents the prosperous thriving economy in Vietnam. White, light pink and cognac are the main hues in the crown which represent inspiration and feeling.Each piece of the crown was designed to represent an important attribute of the Miss Universe Pageant. The curves of inlaid precious stones represent the strong development and potential of each country. The image of the crane (Lac Bird) symbolizes Vietnamese spirit and culture. The image of the heart represents unified breath, rhythm and vision, which are powerful internal forces that stress faith, hope and unity. It reminds me of the movie Man cheng jin dai huang jin jia(Curse of the Golden flower)? The design of the crown is distinctly eastern and seems like one of the organic(?) ones worn by Gong Li in the movie. I highly recommend the movie, its amazingly beautiful! And here comes the real motive behind this blog post. Its a grouse. Why doesn’t the Mr World guy get a crown ?? I think guys should get crowns too … or something. A nice watch? or Koenigsegg CCXR? How about that years Miss World :D? It’s a little ostentatious for my taste. How about a Faberge-inspired design? Gong Li should be Ms Universe. Well I think the new crown is rather elegant, checkout the earlier designs, now those were ostentatious. @Righto – I second that! I don’t think Miss India would win this time, it would most likely be Miss Venezuela. i don’t buy the “light pink signifies inspiration” theory. I liked the previous crown better. The phoenix feather design was amazing and depicted hope, prosperity, beauty and life. N E wayz This Year India will take the crown. She is a beauty with excellent brains, and she is the only contestant to place in all 3 of the preliminery competitions, Ao dai, swim suite, and national costume. I liked the Mikimoto crown better. The Mikimoto crown was way prettier. Does this mean the Miss USA and Teen USA crowns will change too? Eww. it think it is ugly. it doesn’t stand out much at all….from a distance. the mikimoto would be so obvious like the one before that… but when I see this one on stage it looks like any blah crown anyone else wears… it needed to be so much more original. I really don’t care how much it costs… it is 100+ thousand dollars of ugly. It is very disappointing to have the crown changed to something that appears downplayed from previous styles. The color, the design pattern & overall style does not fit the caliber level of traditional Miss Universe crowns. Highly disappointing. Bring Mikimoto back or even the style before Mikimoto! this is just a Vietnam design, it looks like a crown you parade on normal street. It may cost a lot but it doesn’t stand out. Mikimoto and the previous one is much better. Seems that Ms. Universe organizers are getting cheaper taste these days. Ms. Universe 2007 when she was crowning the winner, is dressed up like she is applying for a job! A business attire! I don’t get the essence of this pageant anymore. Its getting lousy by the year! Don’t worry the Mikimoto crown will be back next year. I think they changed the crown this year for appearance sake. This was the first year that Miss Universe was held in a communist county and the Mikimoto crown is the most recognizable and sought after piece of jewelry in the world. Absolutely brilliant andback , these are wonderful pieces – so personal and unique too, I’m sure the recipient will love them! !